Most of us have our data spread across several devices, storage media, or services. Storage capacities continue to expand at affordable prices, digital devices diversify, and as a result we are increasingly moving data to the Cloud. Do you even have a use for your old hard drive anymore? Once you understand how a hard drive works How Does A Hard Drive Work? [Technology Explained] How Does A Hard Drive Work? [Technology Explained] Read More , you realize you’d be better off storing your data on something more reliable than an old HDD. 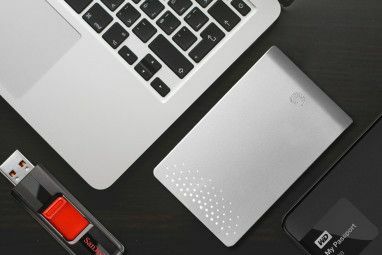 It is a fact that hard drives eventually fail 5 Signs Your Hard Drive Is Failing (And What to Do) 5 Signs Your Hard Drive Is Failing (And What to Do) Since a majority of people today own laptops and external hard drives, which get dragged around quite a bit, a realistic hard drive lifetime is probably around 3 - 5 years. This is an extremely... Read More and sometimes warning signs precede the end of their lifetime. Or maybe your hard drive is dead already. But wait! Don’t trash it just yet. First, hear what I have to tell you about old hard drives. It Might Still Work Perfectly Fine! Did I scare you with my introduction? Well, not every hard drive is bad just because it’s old. As long as you don’t use it to store critical information or at least maintain a backup of important data, you should be fine. Meanwhile, make sure you notice the signs of a failing hard drive 5 Signs Your Hard Drive Is Failing (And What to Do) 5 Signs Your Hard Drive Is Failing (And What to Do) Since a majority of people today own laptops and external hard drives, which get dragged around quite a bit, a realistic hard drive lifetime is probably around 3 - 5 years. This is an extremely... Read More and maybe run some maintenance tools that can predict and potentially prevent hard drive failure 4 Tools To Predict and Prevent Hard Drive Failure 4 Tools To Predict and Prevent Hard Drive Failure f there is one piece of equipment in your computer that you would predict to fail first, what would it be? Read More . As long as your hard drive is working well, there is no reason to trash it! Maybe It’s Not Entirely Dead! So you think your old hard drive is dead? If you have data on it that you wish you could recover, you should diagnose and potentially fix your seemingly dead hard drive How to Repair a Dead Hard Disk Drive to Recover Data How to Repair a Dead Hard Disk Drive to Recover Data If your hard disk drive has failed, this guide will help you with the hard disk drive's repair and data recovery. Read More before properly disposing of it. Maybe you are lucky and it’s not all that dead, after all. In case your hard drive shows unexpected vital signs, be prepared to immediately back up your data 6 Safest Ways to Backup & Restore Your Files in Windows 7 & 8 6 Safest Ways to Backup & Restore Your Files in Windows 7 & 8 By now, we're sure you've read the advice over and over: Everyone needs to back up their files. But deciding to back up your files is only part of the process. There are so many... Read More , something you should do regularly to start with. If the hard drive just wouldn’t boot your operating system, but is otherwise working fine, you will probably be able to copy the data How To Copy Data From A Laptop How To Copy Data From A Laptop Laptops have a particularly short lifetime. While it is possible to upgrade laptop hardware, one day the time will come when that is just not possible or worth it any more. This is when you... Read More with relatively simple methods, for example using a Linux Live CD / USB Windows Users: Here Is Why You Need A Linux Live CD Windows Users: Here Is Why You Need A Linux Live CD Read More . If you have reason to suspect that your hard drive has bad sectors and corrupted data, you might want to try a professional tool like SpinRite to recover your data. It Might Still Be Useful! Are you sure you no longer need the hard drive? If it’s still working fine, there are many cool things you can do with it, either for the sake of having tried something new or to add a cool feature to your home setup. Check out these cool ways to breathe new life into your old hard drive 3 Ways To Breathe New Life Into An Old Hard Drive 3 Ways To Breathe New Life Into An Old Hard Drive It's in the human nature to collect stuff and in the digital age we mostly collect data. 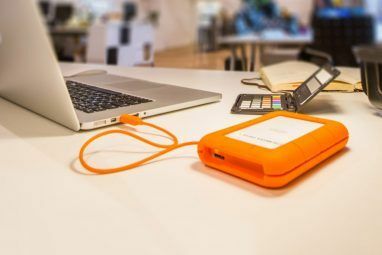 For a long time, the storage capacities of hard drives seemed to increase too slow to match user... Read More ! Maybe you can’t be bothered to dig into old hardware and search for usable data, but what if someone else can? Oh, you formatted your hard drive? Well, unless you performed a non-default low level formatting The Difference Between Windows Full Format & Quick Format [Technology Explained] The Difference Between Windows Full Format & Quick Format [Technology Explained] When installing Windows, the installer will ask you a strange question - how do you want to format your hard drive? For Windows systems, there are only a few possible answer choices. You either format... Read More , your data is still there and waiting to be harvested. What you need to know is that due to how the Windows file system works What A File System Is & How You Can Find Out What Runs On Your Drives What A File System Is & How You Can Find Out What Runs On Your Drives What is a file system and why do they matter? Learn the differences between FAT32, NTFS, HPS+, EXT, and more. Read More , simply deleting a file or formatting the drive won’t actually delete the information! The only way to make sure the average geek will find it impossible to recover the files Why It Is Impossible To Recover Data From An Overwritten Hard Drive [Technology Explained] Why It Is Impossible To Recover Data From An Overwritten Hard Drive [Technology Explained] Recovering deleted data from a hard drive is generally possible because typically the actual data is not deleted. Instead, information about where the data is stored is removed. In this article I will explain how... Read More , is to overwrite them; multiple times. If the idea of someone else getting access to your files makes you nervous, you better look into ways to wipe your hard drive How to Wipe Your Hard Disk Drive Leaving the OS Intact How to Wipe Your Hard Disk Drive Leaving the OS Intact So you want to get rid of your computer. To keep your data secure you will want to securely wipe the drive. This ensures that no one can recover the deleted files. However, you might... Read More to permanently delete sensitive data 5 Tools To Permanently Delete Sensitive Data From Your Hard Drive [Windows] 5 Tools To Permanently Delete Sensitive Data From Your Hard Drive [Windows] In a recent article I explained why it is impossible to recover data from a hard drive after overwriting it. In that post I mentioned that simply deleting files or formatting your hard drive typically... Read More . Of course this doesn’t guarantee that some intelligence agency won’t still be able to read the data or that the NSA didn’t somehow manage to gather a copy for their own PRISM backup Can You Escape Internet Surveillance Programs Like PRISM? Can You Escape Internet Surveillance Programs Like PRISM? Ever since Edward Snowden blew the whistle on PRISM, the NSA's no longer secret surveillance program, we know one thing with certainty: nothing that happens online can be considered private. Can you really escape the... Read More . In case you can no longer access your hard drive with software, you can always destroy it physically to prevent data recovery How To Completely & Securely Erase Your Hard Drive How To Completely & Securely Erase Your Hard Drive Read More . Unless your hard drive is still functional and can be donated for re-use 5 Great Ways To Donate Your Old Computer 5 Great Ways To Donate Your Old Computer Read More , it should definitely be recycled! Electronics contain a lot of precious materials Thou Shalt Consume: The Story of Consumer Electronics [Feature] Thou Shalt Consume: The Story of Consumer Electronics [Feature] Every year, exhibitions around the world present new high tech devices; expensive toys that come with many promises. They aim to make our lives easier, more fun, super connected, and of course they are status... Read More that cost huge amounts of energy and caused a lot of damage and pollution to be extracted from the Earth’s crust. To not recycle those materials means we will be causing more destruction, as well as increasing ecological, social, and economical damage. In this day and age, wasting resources is not an option! You can contribute to the conservation of natural resources by consuming (buying) less and reducing the amount of waste you create. The latter means you have to recycle. In most European countries, electronics stores and manufacturers have to take back their old devices. If you are in the US, check out the homepage of the Environmental Protection Agency (EPA) for resources on electronics donation and recycling. Whether your old HDD still works or not, there is still a lot of value in it. You might still be able to recover your data, start a cool project and learn something new, or a recycling company might salvage rare metals from it. Really, the worst you can do is to trash it and send it to the landfill. Your (grand) kids will not approve! What have you done with your old hard drives? And can you think of other reasons to keep them? Please share your ideas in the comments! The Best Prebuilt, DIY, and NAS Solutions for a Plex ServerStoring and Accessing Data Using Raspberry Pi: What Are Your Options? Hi, having just had a 2012 vintage 1TB Samsung 2.5" drive fail on me it does seem an awful waste to just scrap it because the data is basically intact and I already cloned it. The fault was actually almost identical to the 500GB it replaced ie it suddenly stopped booting one day but this time no "Disk read error". Seagate Diagnostics showed a problem on the basic test so my working theory is that they start drawing more and more power (motor failure maybe?) and eventually the laptop can't handle it and the system becomes unstable. I have retrieved a fair few drives this way simply by increasing the power availability using an external wall wart PSU and also recovered a few SSDs and SD cards using this method. Sometimes they won't work at 2.7V but work fine at 3.0V ot 3.3V, perhaps the regulator goes funny or there is internal corrosion causing resistance ?! I just replaced an aging 1TB (part of a set of two) which has become nearly full with a 2TB drive. Since the old drive is still working, I simply treat it as an "archival" storage media which can hold an additional backup of the data that was on it. So if you have an aging, but fully functional nearly full hard drive, replace it and save it as an additional "archive" of your data, with or without installing it in an external enclosure. As long as the drive doesn't develop "stiction" over time, it will be usable for an emergency. I've turned old HDDs into clocks as leaving presents for people before. Take off the cover to expose the platters, use a centre punch to pop out the spindle, install a clock mechanism from Hobbycraft or wherever and mount in a display case. Usually pays to remove the strong magnets mentioned in a previous post, if you want the clock to actually keep reasonably accurate time. "Once you understand how a hard drive works, you realize you’d be better off storing your data on something more reliable than an old HDD." And what might that be? The Cloud? And what do they use for storage if not HDDs? SSDs have a finite number of writes before they go belly up. CD/DVDs are even less reliable than HDDs. Magnetic tape has been discredited as a storage medium some time ago. Until some entirely new technology comes along, hard drives remain the best storage option. Cloud Storage is the latest craze. However, it provides a false sense of security. First of all, by storing our data in the Cloud, we give up control over it. Once in the Cloud, our data is subject to the whims and vagaries of corporate policy. It can be held hostage by the storage provider. When storing our data locally, we only have to worry about the health of no more than a few drives. Cloud storage provider has to maintain thousands of drives healthy. With tens of thousands of users constantly pounding on those drives, the chances of failure are multiplied by several orders of magnitude over our local drives. Cloud storage is also the latest example of "Let George do it." We are passing the responsibility for data storage, data safety and hard drive maintenance to someone else. We want to have as little to do with the maintenance of our computers as possible. We just want to sit down and play WoW or Myst and let somebody else worry about our computers. BTW - As someone already said, no overwrite is secure enough. Data can still be recovered. It may cost a lot of money but it is possible. To make sure nobody can recover my data, after disassembling my drive, I perform percussive maintenance on the platers with a 16 pound sledgehammer. I always remove the HDD before scrapping a PC, its easier and safer than trying to wipe the disk. There's probably not much of value on there but maybe some passwords could be recovered. Trouble is I've now got a dozen or more going back decades to tens of MB capacity, yes Megabytes, not Gigabytes! I'd recycle but would need to trust the recycling company, so maybe stripping them down to components first is the answer. Some of the secure wipe programs are good enough for the security services but take a long time, require that the disk is functional, and that you still have a way of connecting an IDE drive, recent PCs are now SATA only. I went to an arts and craft show and found a woman who was using computer parts to make really cute jewelry. Little robots on a chain necklace and such. My only concern was whether any of the metals or paints were toxic being so close to one's body. Putting a few nails in the platter will essentially destroy the data, and it will can be recycled after the fact. Perhaps if you'd rather not do that, you could call around and see if any of the recycling centers have a hard drive degausser and watch them put your old hard drives in and out of it. The deguasser removes all of the magnetically recorded data on the hard drive. The data is effectively destroyed forever. I rescued the very polished shiny metal disk from an old hard drive and use it as an emergency heliograph for when I'm hiking. It has a second use as an unbreakable shaving mirror. 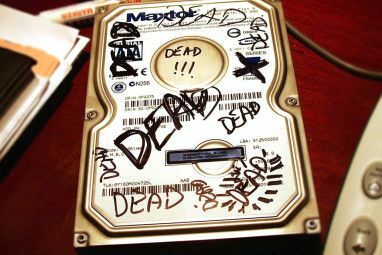 I'm sure makeuseof commentors could come up with many more uses for a dead/discarded disk! Seriously, the hard drive on my ThinkPad R51 (it's not with me by now) is still perfectly alive after almost 9 years. 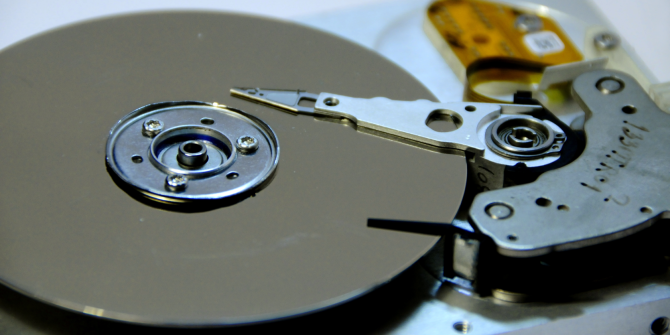 In terms of data recovery you should be careful with any hard drive you have. No matter what file system you use or how many times you format it. It can still be possible to reconstruct the data. Using programs like ddrescue and testdisk you can clone the drive/make an image of it, then recover data that has been formated over and over even if it you switch file systems. Thanks for the heads-up, Chris! There can never be enough warnings about data security risks. The platter make great wind chimes. The motors can be salvaged for use in automation. The cases are aluminum, and easily recycled. Love these creative up-cycle ideas, Anthony! Thanks for the tip, now i know what i'm going to do with about ten of them that i have around. Some motorcycles, sub compact cars, and bicycles have trouble tripping traffic lights. Attach magnets like those underneath them to fix the problem. There is a pit under each lane at traffic lights in the USA. In this pit is a wire loop that creates a magnetic field. When your vehicle breaks that field the light is tripped. Smaller vehicles don't generate enough magnetism from their tires or engines to trip the lights. They claim it works with old HDD magnets. And from what I've seen they are really strong magents. "they can hold 5 lb’s (11 kg ) easy"
Sorry but your numbers are a little bit off. One pound equals .45 kilograms. So the HD magnets can hold up 2.25 kg. Still not bad but not as great as you would like. There are awesome magnets inside of them! Crack those puppies open and you will find two of the strongest magnets that you have ever lain your hands on! Don't snap it to your car or fridge, you'll have a hard time getting it off! So you essentially recycle parts of your old hard drive. Very cool! Thanks for adding this one. Dwight, that is a really cool tip. I can't verify whether this really works, but I'm still going to quote you in one of my upcoming articles. you missed an obvious one and perhaps the best reason! Get a container for as low as $10 and you now have an external portable hard drive. I haven't. I just resisted the urge to re-write an article I published recently. Instead, I added several different perspectives on why you shouldn't simply trash an old hard drive and only linked to my previous article 3 Ways To Breathe New Life Into An Old Hard Drive under the point that an old hard drive might still be useful. Thank you first for the response Tina and also for the good link. Maybe in future add a "see also ..." for geezers like me!